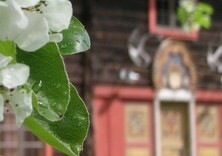 From majestic waterfalls and towering mountains to museums and cultural history. 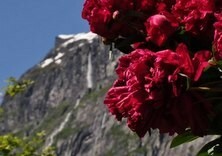 Here is some of what you can experience in Sunndal - wild and beautiful. Innerdalen has frequently been called the most beautiful mountain valley in Norway. Drive rv 70 road between Sunndalsøra and Tingvoll, turn towards Ålvundeid and follow the signs to Innerdalen. 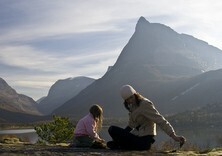 Park your car and enjoy a stroll for an hour, on the 4 kilometers to the heart of Innerdalen. Vinnufossen has its outspring from Vinnubreen glacier, which is Møre and Romsdals largest glacier, and cascades down the mountainside with a 860 meters drop in several steps. 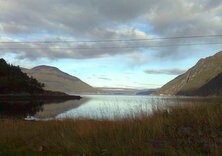 Vinnufossen can be experienced from a laybay on highway 70, just a few kilometers from Sunndalsøra towards Oppdal. A unique natural phenomenon in Norway. Steep mountain cliffs, moraine ridges and terraces create a fan-shaped river system where four rivers meet. Several thousand years of cultural history in one small area. Here is one of the largest burial grounds from the Iron Age, an more than one hundred years old British landscape garden with a floral wealth of more than 50 species of plants, as well as a rural museum that tells the history and culture of Sunndal over the centuries by means of the buildings and objects. Central to the story on Leikvin is the British salmon fishing and the history of Sunndals uncrowned queen, Lady Barbara Arbuthnott. In Seterlandet Sunndal you take part in the life on a traditional summer pastures farm, a long with the farmes, goats and cows. 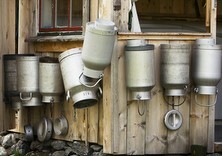 The farm produces traditional food, a tasty treat for many a tourist. The food tastes even better in an mountain farm environment, among authentic farm houses in the beautiful mountain scenery. In this setting you will guaranteed lower your shoulders. Aursjøvegen - from fjord to fjord crossing rugged mountains. Aursjøvegen is a road to high mountains and wild valleys, intoxicating waterfalls, rock pools, power history, marked hiking trails and the great outdoors. Flåøya - the Flå irland - is a beautiful peninsula by Flå in Sunndalsfjorden. 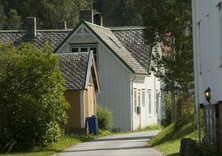 Flåøya is a popular outdoor and recreation area for the people of Sunndal. The irland has an interesting culture and landscape with traces of activity from the Stone Age to today. 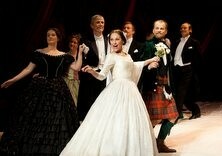 See the musical "Lady Arbuthnott" about Sunndals uncrowned queen. Barbara Arbuthnott is the lady from the Scottish aristocracy who came to Sunndal on her honeymoon in 1866, and fell in love with the valley and settled here. Øksendalsøra - a living tradition. Øksendalsøra, comprising tre river estuaty, the beach areas and the architectual environment, make up a whole with great preservation value. 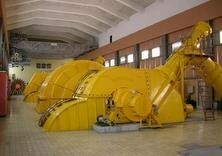 Hydropower has played a significant role in Sunndal and the Norwegian industry. In the visitors center Aura Visningsverk you can see the great movie about Aura Power Plant from 1913 to 2008 and get the guided tour inside the mountain, in the power station. Sunndalsporten - The Port of Sunndal - is situated at Gjøra by the rv70 between Sunndalsøra and Oppdal. 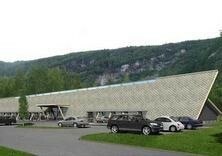 Here you can find a grocery store, tourist information, gas station and Driva River Center. Family friendly activities and hikes outside. Sunndalsporten is a natural stop-point on the way to Åmotan and Dovrefjell-Sunndalsfjella nationalpark, and to the Northwest region.